Providing you with accurate and up-to-date company accounts. By choosing us as an accountant we are here for all of your queries. We’ll help fulfil your legal duty to enrol all of your staff into a workplace pension. Saving you time and money, freeing you up to concentrate on your business. We will complete your self assessment for you and submit the documentation to HMRC on your behalf. VAT registration in addition to completion and filing of VAT returns. We will also submit your VAT returns to the HMRC for you. 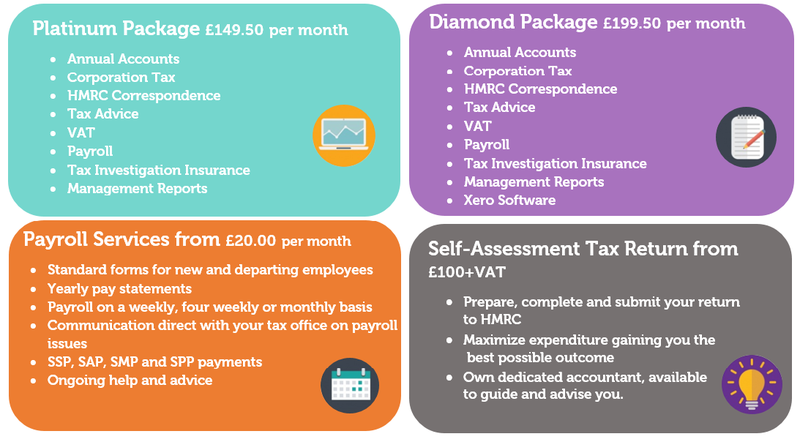 A range of payroll processing services for small to large businesses. You will be given your own personal accountant who’ll be more than happy to help with any queries. Completing, checking and processing your Construction Industry Scheme tax return. Getting your claim started couldn’t be easier. I needed some advice as I was going to go from sole trader to limited. I didn’t have a clue what to do. The Right Accountants then arranged a face to face appointment for me and the guy that came out knew exactly what he was doing. I now pay £47.50 per month and The Right Accountants complete everything for me. Recommended all my friends. Best accountancy firm I’ve been with. Always there when I need things explained to me and remind me of any deadlines. I switched to The Right Accountants after eight long years with my previous accountant. Price was the initial influencing factor, however the professional service along with a dedicated accountant was more than I could ever wish for. The Right Accountants currently look after my company’s Payroll and VAT returns and are always available for help and advice. I would definitely recommend their services. As a self-employed massage therapist I found The Right Accountants to be extremely efficient, responsive and helpful in preparing my self assessment return. I had a lot of queries as it was the first time I had used this company and they were very patient in explaining how they’d arrived at the final figures. Excellent value for money and I will certainly use The Right Accountants again. I would like to thank The Right Accountants for helping me stop worrying over things I am not sure about. Adam was very helpful in sorting this out for me, this resulted in having a good nights sleep. I am self employed and have been for five years. Over the years I have paid stupid amounts for accountants until I came across The Right Accountants. They dealt with my self assessment tax return on my behalf and all I had to pay them was £75… bit of a difference for me as my accountant last year charged me £345. Definitely recommend The Right Accountants. Over the past seven years I completed my own tax returns and each year I struggled understanding the forms. They offered to complete my tax return for me for £75 and having being quoted £300+ by other companies in the past I jumped at the chance. The Right Accountants completed everything for me for £75 and the process was easy to understand. They are a polite, professional experienced company. I used The Right Accountants as I wanted some help with my CIS tax return. The whole process with The Right Accountants was very straightforward, and after emailing them some basic information, they did all the rest. I would certainly recommend The Right Accountants to other; they are good value, professional and provide a good service. Brilliant service and very helpful staff on hand to help me with my application process. Will recommend you to my friends and family. We will not be beaten on service or price.